Expanding the Augusta Common and attracting more urban dwellers is the city’s best and quickest shot to revitalize downtown. 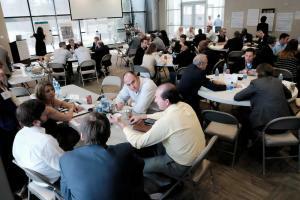 That was the consensus reached Wednesday by more than five dozen business and community leaders at a “Downtown Summit” organized by Augusta-Richmond County and the planning group Augusta Tomorrow. The unprecedented gathering of downtown stakeholders was spearheaded – and partially moderated – by Augusta Tomorrow board member Doug Cates, who said the summit was needed to unify and coordinate the efforts of the city’s sometimes disparate business and political interests. He said widespread urban revitalization has been slow to occur because no one individual or entity is willing to take the risk needed to bring “transformational change,” likening hesitant investors to sheep afraid to stray too far from their herd. “Nobody wants to be walking out by themselves,” said Cates, a partner in accounting firm Cherry Bekaert LLP. “Of the sheep in a herd, who gets eaten first? The one that got out of the herd. Limiting their ideas to downtown projects that could be completed in two years, participants focused most discussion on expanding Augusta Common – north to the riverfront and south to Ellis Street – and getting more people living in the “Broad Street corridor” by converting the vacant Marion Building and under-utilized Lamar Building into apartments. The Marion Building is owned by a limited liability company headed by Augusta businessmen Clay Boardman and Barry Storey, both of whom attended the summit and are interested in converting the 10-story property to residential. The 102,000-square-foot Lamar Building is owned by a Greenville, S.C.-based bank and has been up for sale since 2014. Blanchard and Calhoun’s Davis Beman, a summit participant, said an investor from outside Augusta is under contract to purchase the property and is considering converting the 19-story building into a mixed-use development. Downtown Augusta has 220 traditional apartment units in the Broad Street corridor with a 98 percent occupancy rate, according to the Downtown Development Authority. If the city doesn’t boost the number of units in the next two years, it might miss out on the wave of potential urban dwellers brought by expansions at Fort Gordon and Augusta University. Some participants in the summit last month toured Columbia, which has 5,000 apartment units in its downtown and is undergoing a significant revitalization. Cates said projections show the city could easily support 1,000 more units, which in turn would encourage more retail, restaurants and supermarkets in the urban core. “If we’re really going to have sustainable growth, and if our tax base is going to grow to give our city more money to do the things that our commissioners and mayor would like to do, then its going to come from people living and working downtown,” he said. Other ideas discussed included developing a light-rail system that would loop around downtown and the medical district and adopting more “business friendly” city ordinances for the central business district. Another suggestion was building pedestrian links to North Augusta via an aerial gondola at the proposed baseball stadium and a foot bridge near Fifth Street. Summit participants also heard an update on a plan to transform part of the historic Sibley Mill to a 10-megawatt data center, a “cyberworks” unique for its size and proximity to Augusta’s growing cyber campus. “Augusta has an enormous opportunity with the ingress of Cyber Command, with the seismic event of 4,000 new jobs in technology and with the obvious focus of federal attention and all of the different organizations that are going to enable the deployment of the mission of cyber security,” said James Ainslie, a principal with Cape Augusta, the firm backing the fledgling proposal. Located on the periphery of downtown in the Harrisburg mill village, the mill encompasses 500,000 square feet of space and could benefit from a variety of tax credits, he said. Once a Confederate powder works, the former textile mill – “an icon of Augusta” – could leverage existing hydropower capability to cool the equipment that could be stored there, Ainslie said.